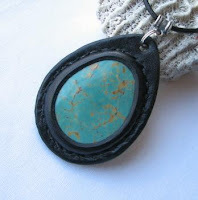 One of the stones I have lusted after for my Earth Medallions is Turquoise in large cabochons. 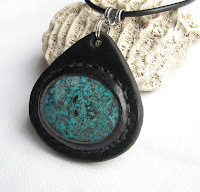 Turquoise is one of the most valuable non-transparent minerals in the jewelry trade. Known to be prized by early Egyptians, it is among the oldest gemstones used by man. This prohibitively expensive gemstone has eluded me until now. These turned out so nicely! It won't be easy to part with them -- the jewelry fiend that lives in me wants to keep them all! I just may have to resort to begging, but I will wrangle more out of Karl if at all possible! I thought it might be nice to post a few of my favorites from my most recent creations, but the choices are not easy. From the ten I just listed, I have decided to show three here... but which three? 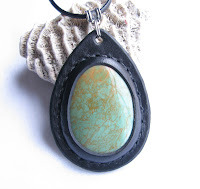 There is this lovely African Turquoise Jasper pendant. The color is so vibrant it fairly bursts from the black leather setting. 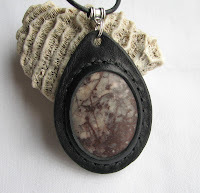 And ooohhh -- I can't leave out this amazing bit of Eagle Eye Agate. Such delicate artistry -- it's like a tiny painting, courtesy of the Earth. Kona Dolomite is a sentimental favorite of mine, since it comes from my beloved Upper Peninsula. 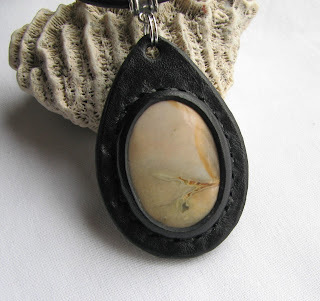 Add to that the wonderful ancient beauty of the stone itself -- definitely a favorite! This was tough -- I left out seven of my other favorites, including some Leopard Skin Jasper and a couple of new Unakite pieces..
You can see them in my Etsy Listings. More coming soon! One of the coolest things I learned early in my leather-crafting history was the three-part inside trick braid, known far and wide as the Mystery Braid. The mystery of this braid, and the fun, lies in the fact that it's braided with both ends closed. 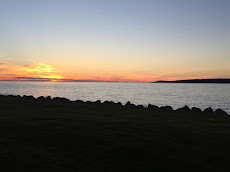 People often surmise that there are cleverly hidden slices and splices involved. Not so. As the name implies, there's a trick to it... an inside trick that I've put into a short tutorial video for you. In less than two minutes you can see how it's done -- in no time at all you can master this trick braid yourself! You'll find the video box at the bottom of this post or, if you prefer a larger view-window, you can see it on You Tube by clicking here. A few points to remember: Braiding will shorten what you're working on, so measuring can be tricky. The amount of shortening depends on how thick your material is, how long the item is and how tightly you braid. 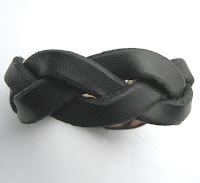 You'll want to experiment with this, but a good beginning rule of thumb for making full-grain leather belts or wristbands is to cut the plaits longer than the area you want braided by about 1/2 inch for every ten inches of braid. In other words, if you want a twenty-inch section of a belt braided, cut your slices twenty-one inches long. I punch a hole at the end of each slice for tidiness and to help the ends of the braid to lie smooth. All dyes and finishes should be applied before you braid, including your edge-coating. 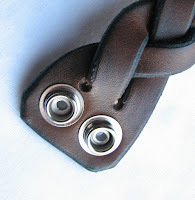 Vegetable-tanned tooling leather should be wet before braiding -- this won't hurt the leather finishes I normally use; if you are unsure of your products, you'll want to do a test-braid first. I always retreat the finished braid after it dries with a spray silicon for added protection. With just a bit of practice you'll be weaving mysteries of your own!